German Meeting Haus, just South of I-70 ramp on 3rd South and WILLOW. (TURN LEFT ON WILLOW) Park behind the Golden Hobby Shop, (just South) or St. Mary's school (also South), but NOT in the bank parking lot. Or street parking or park at Freepress offices one third mile north. Richard Hayes Philips, the investigator whose research into Ohio 04 ballots is the basis of lawsuits against a fraudulent election, will also share his latest research in Ohio. Other voting rights activists will tell what they have been doing. Don't be frustrated, get organized! Let's get ready for Nov.7. $5 donation requested to defray costs. Refreshments for free. Seating may be limited, get there early. Table for your group, $10, no candidates, prefer non-partisan. Email for availabilily. Join us afterwards for supper in a restaurant. Please pass this email on! She doesn't get here from Seattle often!! Last time was Jan 05. The focus of this CASE News email is the November General Election in Ohio. It includes some information and actions you can take to help more people vote. Updates will be sent as needed and will include projects coordinated by other election advocacy groups. Send comments, suggestions to ron@caseohio.org. Feel free to forward as appropriate and invite others to join http://groups.yahoo.com/group/CASE_OH_News/ to get these updates. This group is not a discussion group so you will not get a lot of email. Many people do NOT yet know that ID will be required to vote! Available in English or Spanish. You can tell your friends, help distribute, identify organizations that might want them, ask your Senator or Congressperson to publish in constituent newsletter. You can help identify student groups, college newspapers to send it to. Statewide election hotline 866-OURVOTE (866-687-8683) goes live October 16. Spread the word. You can work for your county as a poll worker. See below about learning what to look for and gathering incident reports. Phil Fry met with BOE officials in Darke & Shelby counties. Three members of CASE have been invited to participate in the Election Protection meetings, which include Common Cause, People for the American Way, the League of Woman Voters, and other organizations. Sept 29-30: "We Count - A Conference about Fair Elections and Democracy" in Cleveland featuring Mark Crispin Miller, Bob Fitrakis, Bev Harris, Ron Baiman, Greg Coleridge and many more. Contact Victoria.Lovegren@case.edu or go to www.wecount2006.org for more information or to register. Tell your friends. Send email to political (or non-political) groups. Call a local library and ask them to put some flyers at the checkout desk. Contact organizations that might distribute them (target audience includes students, low income, and senior voters in urban areas). Contact your congressperson and ask them to publish the flyer information their newsletter. Call and offer to email them the flyer. Contact Ron if they want help condensing the material. Ohio Vigilance & CASE Ohio are coordinating this effort to gather precinct level vote totals at as many precincts as possible. Then we compare our date with official results. We have a list of counties that have said they will post results. Ohio counties will be particularly challenged by Voter ID requirements and need poll workers who care about fair elections. There may be no better way to work for fair elections. CASE is working with Pollworkers for Democracy to distribute information on what to look for and coordinate gathering of incident reports. We expect details from other advocacy groups on an observer program which will be distributed. County Summary: have active volunteers: 15, tentative volunteers: 9. Write a plan on how we think a newspaper should cover the pre election, election, and post election phases of the election. For example: clear & documented rules on Voter ID/Registration, fair allocation of voting machines, posting precinct results, post election check of DRE totals. Send letters to each newspaper, ask them for their plans, and issue a press release. Come up with citations from the Revised Code, media, etc. (e.g.,what types of ID are acceptable since HB 3). CASE could use a team of folks doing this. Folks connected to law, media, political science may be especially good. News - we are no longer maintaining news - Should we? Many, many more. Choose the area you are interested. Just get me the details and I can post it. Start planning for after November 7th. An organized post election audit and report should be done by BOE’s, but if they won’t maybe we should. Bob Fitrakis -- a person who needs no introduction to readers of this blog -- is running for Governor of the State of Ohio, on the Green Party Ticket. Needless to say, his election would be a tremendous victory for voting rights, and for democracy. To hear a recent radio interview with Bob, go here. Screening Schedule for Dorothy Fadiman New Film, "Stealing America: Vote by Vote"
Place: Camp Democracy, between the Mall and Constitution Avenue, 14th/15th Streets, at the foot of the Washington Monument. Cost: FREE. Viewers will be invited to make a donation. Film will be introduced by Bob Fitrakis and Jonathan Simon. The filmmaker will not be in attendance. Film will be introduced by Matthew Segal. The filmmaker will be in attendance. The filmmaker will not be in attendance. Film will be introduced by Mark Crispin Miller. The filmmaker will be in attendance. Film will be introduced by Bob Fitrakis. The filmmaker will be in attendance. The filmmaker will be in attendance. Place: Cuyahoga County Community College, 2900 Community College Avenue. The Theater in Media and Theater Arts (MTA) building. Cost: $5/ticket. Free for We Count conference attendees. STEALING AMERICA: Vote by Vote brings together behind-the-scenes perspectives from Election 2004. Interviewees include voters who experienced hardships, poll workers, computer experts, nationally recognized journalists, as well as others concerned about the Presidential election of Nov. 2, 2004 and democracy in the United States. For more information or to arrange a screening, please visit www.stealingamerica.org. "Election Integrity" is not a partisan issue. Without fair and honest elections, there is no functioning democracy! Learn the truth about our electoral process and the many ways it subverts the will of the people. Yes, massively fraudulent elections CAN happen and ARE happening here in America, a terrifying fact that becomes increasingly obvious as the "leadership" departs ever more radically from the views of the electorate, as registered by every opinion poll, but somehow never by an election. You can help us build a Democracy Movement that seeks to reclaim the democratic ideals fought for - died for - by our founding fathers and patriots, and in ongoing struggles for human rights. "We Count - A Conference about Fair Elections and Democracy"
Cuyahoga Community College (Metro Campus). Learn from fabulous speakers (Mark Crispin Miller, Bev Harris, Bob Fitrakis and many more--see www.wecount2006.org ) fighting against the implementation of privatized elections and electronic voting machines, investigating election anomalies, analyzing election data, bringing the truth about our elections to the public, developing "systems" to promote election integrity, writing articles and books, educating the public about the dangers of electronic voting, exposing the many types of voter disenfranchisement, and otherwise working for every American's right to vote and have that vote be counted. We expect many other organizations to join us once we publicize the event! Participate in workshops empowering "average citizens" to play an important role in the election process, especially in the quickly approaching November 2006 elections. Learn to "participate" in democracy! For more information on workshops, see www.wecount2006.org/workshops. For more information, check out our website: www.wecount2006.org. Register today! Get your organization to co-sponsor the event. Volunteer to help with the conference. Donate funds to help us pay for our speakers' travel and other expenses. Tell your friends! Don't miss this historic event in the belly of the beast! Join in the Democracy Movement ! Cleveland, Ohio. 6:00 P.M. - 10:00 P.M. "We Count -- a Conference about Fair Elections and Democracy"
Cleveland, Ohio. 9:00 A.M. - 9:00 P.M. "We Count -- a Conference about Fair Elections and Democracy"
SPECIAL NOTE: This calendar of upcoming events is to promote events which relate to the Ohio 2004 election. If you have information about any such events, and would like me to post them, please email the information to ohioelectionfraud@mindspring.com with "oef" as the subject. 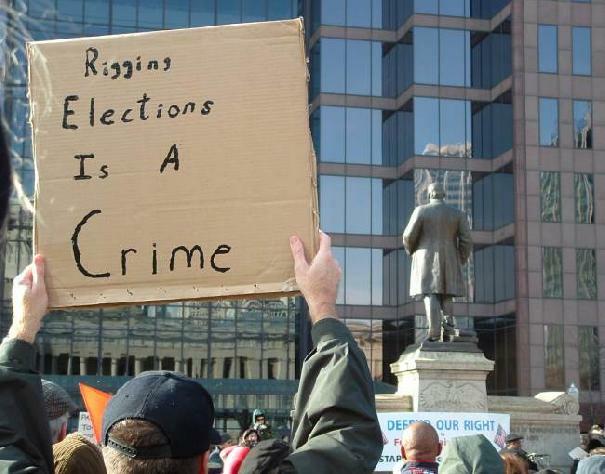 "A coalition of critics of the 2004 election is insisting it has uncovered new evidence of ballot tampering in Ohio that caused a number of John Kerry’s votes to get tossed out. "The group filed a federal civilrights lawsuit yesterday, asking U.S. District Judge Algenon L. Marbley to declare that Ohioans’ voting rights were violated in 2004 and to appoint a special master to ensure fairness in the 2006 election. "The lawsuit alleges that Secretary of State J. Kenneth Blackwell and others conspired to deprive Ohioans of their right to vote. Prior election-related lawsuits by those affiliated with the coalition have been dismissed by various judges. The lawsuit, brought by a number of civic associations and individuals, is captioned "King Lincoln Bronzeville Neighborhood Association, et al, v. J. Kenneth Blackwell, et al", C2-06-743, U.S. District Court, Southern District of Ohio, Eastern Division. It was filed on August 31st. It alleges that the defendants violated the constitutional and civil rights of the plaintiffs, by depriving Ohioans of their right to vote. -use of faulty optical scan machines. The complaint alleges that defendants created and implemented voting policies calculated to discriminate against African-American voters, voters from large urban areas, and students, and seeks a declaratory judgment and a permanent injuction. The plaintiffs are represented by Marshall and Morrow LLC and Arnebeck Law Office, both of Columbus, Ohio. August 23, 2006, Letter of Clifford O. Arnebeck, Jr.
"Massachusetts Sen. John Kerry jumped back into the 2004 presidential race this week with a scathing letter accusing Ken Blackwell, Ohio's Republican secretary of state, of using "the power of his state office to try to intimidate Ohioans and suppress the Democratic vote'' in the 2004 election. "The letter was sent to 100,000 Democratic donors, asking them to send money to U.S. Rep. Ted Strickland, who is running against Blackwell for governor. But it focused on Blackwell as a Republican who must be defeated. "Although Kerry was careful not to suggest that Blackwell and the Republicans manipulated the Ohio vote to cost him the presidential election, he shoved a stick into a very angry hornets' nest. It was George Bush's narrow victory in Ohio that secured his re-election, and livid Democrats and the liberal end of the blogosphere have challenged those numbers since election day." "With paper ballots from the 2004 presidential election in Ohio scheduled to be destroyed next week, the secretary of state in Columbus, under pressure from critics, said yesterday that he would move to delay the destruction at least for several months. "Since the election, questions have been raised about how votes were tallied in Ohio, a battleground state that helped deliver the election to President Bush over Senator John Kerry. "The critics, including an independent candidate for governor and a team of statisticians and lawyers, say preliminary results from their ballot inspections show signs of more widespread irregularities than previously known. "The critics say the ballots should be saved pending an investigation. They also say the secretary of state’s proposal to delay the destruction does not go far enough, and they intend to sue to preserve the ballots. "In Florida in 2003, historians and lawyers persuaded state officials not to destroy the ballots in the 2000 presidential election, and those ballots are stored at the state archive.